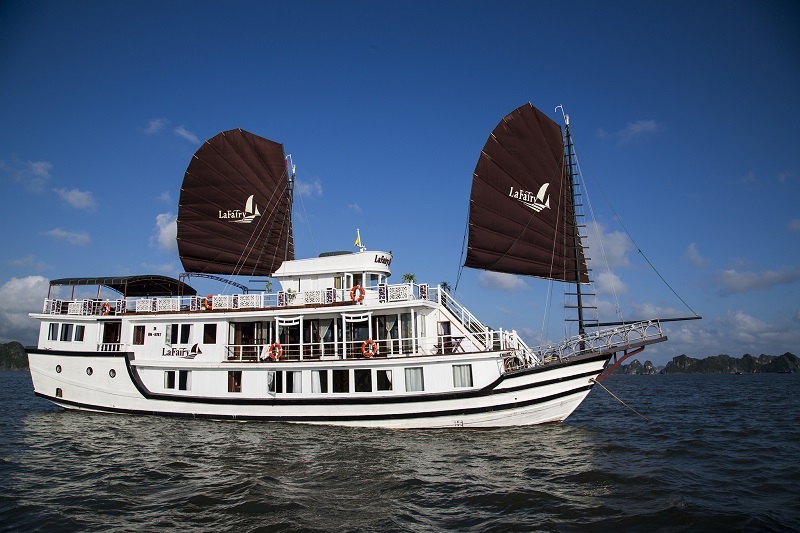 A three day, two night cruise on LaFairy Sails is the perfect choice for you to see the magnificent off-the-beaten-track World Heritage site – Halong Bay and to also get a close look at the area’s unique and spectacular limestone formations and caves. You will visit white sandy beaches, hidden caves, go kayaking, and just relax, all while enjoying the luxury of your comfortable, fully-equipped cruising boat with its well-trained staff and delicious meals. 12:00 – 12:30 : Embark the LaFairy Sails at Tuan Chau International harbor. Enjoy welcome drink, cruise briefing & start cruising. 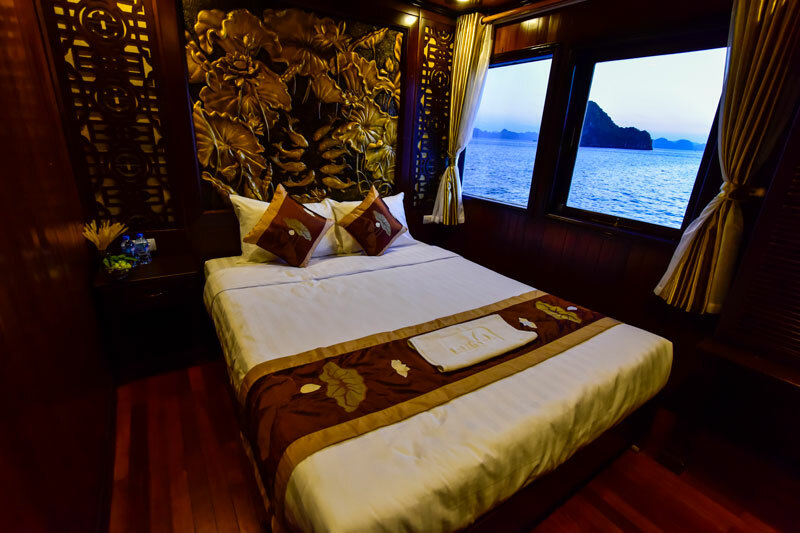 13:00 – 15:30 : A sumptuous is served while cruising into the magnificent Halong Bay with its thousands ofextraordinarily shaped limestone islands, considered by the heaven on the Earth. 15:30 – 17:00 : Explore Lờm Bò area and be charmed by this outstanding masterpiece of Mother Nature. Visit Mê Cung Cave – one of the most beautiful caves in Halong Bay and climb up to see the panoramic view of the bay from above. 17:00 – 19:00 : Return to the LaFairy Sails for a Sunset party to admire the best moments of the day when the sun starts to set. Take pleasure in a fruit carving demonstration. 19:00 : Savor a sparkling and dreamlike dinner on top deck under the light of a thousand stars in middle of the tranquil Bay with extremely delicious food and be awed by a fascinating fruit and vegetable carving show. Delight in traditional music performances. Afterwards, socialize with the artist, new friends and crew members, join squid fishing. Overnight on-board. 06:30 : Start your day with Tai Chi exercises or a photo hunt. 07:15 – 08:30 : Enjoy breakfast in the fresh air and peaceful beauty of the Bay. Transfer to a Day Boat for a day cruise. 09:00 – 10:00 : Go fishing with local fishermen and learn about traditional fishing methods. 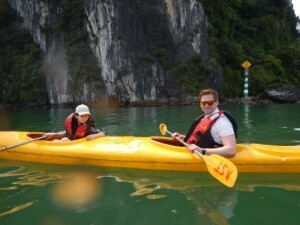 Explore Cửa Vạn Area by kayaking. Swimming and relaxing on the beach. 12:00 – 13:30 : Return to the day boat. Enjoy lunch on-board. 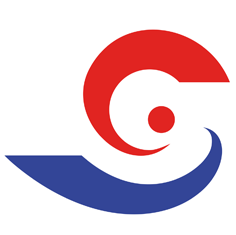 13:30 – 15:30 : Passing the Cửa Vạn fishing village to know more a bout the local life of fishermen. Visit floating Pearl Farm and learn the technique for making high quality pearls. 16:00 : Cruise back to the LaFairy Sails. 19:00 : Enjoy dinner on top deck. of the island to take the breathtaking panorama view of the Bay. 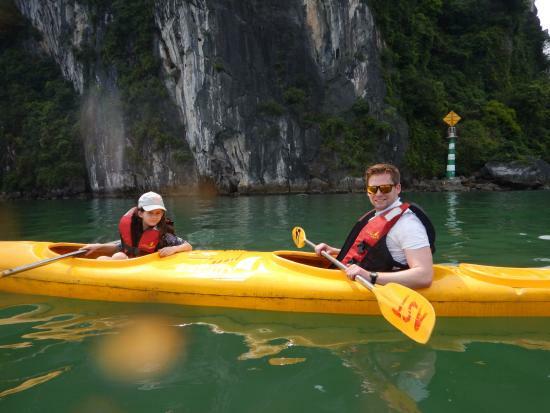 08:30 – 09:00 : Enjoy kayaking through the hidden beauty of the Bay. Advanced reservationsare required with complete passenger details, including Full Name, Gender, Date of Birth, Nationality, Passport Number, Visa Expiry Date.